Week 4 is often the stage in the One Room Challenge where things become a little more… challenging. The initial excitement has worn off. Perhaps you’ve encountered a few hiccups. Maybe your plans have changed or you’re not progressing as quickly as you thought. For some extra motivation–or an extra challenge–for week 4, I decided to host a Good Friday dinner with my family. Which is in the middle of a makeover. This means the room is filled with cans of paint and assorted tools. There is a skim of dust on pretty much every surface. All of the furniture is pulled away from the walls so that I can paint behind it. There’s not room to extend the table so that everyone has a place to sit. Make no mistake, Matt and I tend not to fuss for very much, and we’ve entertained a lot in the middle of numerous renovations. However, I draw a line at having a place to sit for the people that we’ve invited. So I put on a bit of a push to get the painting done. I found I could paint half the room–cut and roll–in 2 hours. Also measured as one baby nap. So I figured I’d be done in 4 days. Instead, I did 2 baby naps and 2 night shifts after she’d gone to bed. And all the painting was done in 2 days, well before people arrived for dinner. In fact, I had time to vacuum and mop the floors, reinstall the cover plates, push the piano and china cabinet out of the way and add the leaves to the table. Woo-hoo. On Friday night, everyone had a place to sit, and we had a great time with family. Also nice, my sister arrived with her router, router table and a case of bits. I’m hoping this router is easier to use than my Dad’s and will help me make the doors for the china cabinet. So the ORC continues. I’m feeling okay about week 4. Two weeks to go. I might be heading into the homestretch. To see the other participants’ progress (some of whom are definitely not in the homestretch–I’m getting nervous for some people! 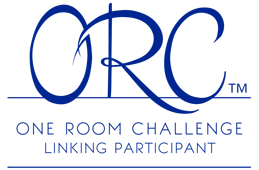 ), visit One Room Challenge. The designer participants share their updates on Wednesday and the guest participants post on Thursday. How do you motivate yourself as projects progress? Do you have any stories of entertaining while renovating? How did you celebrate Easter? 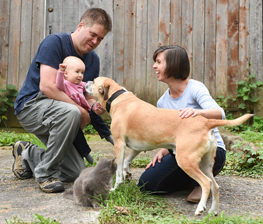 Over the weekend, we marked 7 years of farm ownership. Seven years of sunrises and sunsets, snow and grass, rain and sun, hikes, renovations, work and all kinds of joy. Our project pace has slowed down over the years. But our love for this property has grown. On Saturday morning I bundled Ellie into her snowsuit, plopped her in her sled, clipped Baxter onto his long leash and headed across the fields. Fat snowflakes were falling. Baxter ran everywhere sniffing. Ellie chattered about everything. How amazing that these are our surroundings. How amazing that I can give these experiences to our daughter and our dog. How amazing that I have this for myself. I listened to a podcast last week that talked about the fulfillment we get from our surroundings and the benefits of seeing beauty every day. That is what we have found in the farm. I feel so fortunate in the life that we’re making. Our quest to add to the beauty of the farm is continuous. Looking back over the past 7 years, here are 7 favourite projects. The laundry room was my first One Room Challenge. It was such a simple makeover. We kept the cabinets and the layout, and simply updated them with trim and paint. I decorated the walls with vintage enamel basins, DIYed a clothespin light fixture, pipe drying rack and an Ikea-hack rug. This project shows that you don’t need to do much to completely transform a room. On the other hand, the basement was a huge renovation. We went back to the concrete and rebuilt from there. The result of all of our work is a beautiful, functional space that works and looks exactly as we want. We use the basement every single day and the TV area is our favourite. With our comfy sectional, video game-TV stand, homemade Monopoly art, and lots of other fun little features, this space is casual, personal and comfortable. Ellie’s room was our most recent makeover, and it had to make my list of favourite projects. We coupled the deep turquoise walls with wood, white and neutral furnishings. Then we mixed in family and farm accents for a fun, personal space. Part of our big basement makeover, the bathroom was the most dramatic transformation we’ve had here at the farm. We started with a shower that looked like it could have served as a set in Psycho, And we ended with clean white tile, marble, chrome, a giant mirror, storage, a dramatic black wall… and a bit of barnboard. A farmhouse needs a fireplace. And making it out of stone that looks like it could have come from the fields outside makes it a perfect fit for our little country home. The fireplace is the feature in the living room, and nothing beats a cozy afternoon in front of the crackling flames. Another necessary feature of a farm? A vegetable garden. I will say that our garden is definitely still a work in progress. We added to the fencing, built raised beds, hung a gate, made trellises, installed a waterline and planted grapes, raspberries and other perennials. We haven’t yet figured out how to stay on top of the weeds and we’re always adding more plants, but simply having this space feels like success. The kitchen has a long way to go and will see a major renovation… someday. In the meantime, the addition of our island made such a difference in this room. It’s given us both storage and counter space, and like everything we do around here, we did it simply and relatively inexpensively. We found the doors at the Habitat for Humanity Restore and we DIYed a wood countertop. The island has made it possible for me to tolerate the kitchen until we can redo it entirely. Whether it’s the house or the 129 acres outside, we have more to go–and probably always will–but we’re also super proud and pleased with what we’ve done so far. And we make sure to enjoy and appreciate the life we have here. Thank you all for following along. Our girl is officially one year old! I know everyone says time flies, and it definitely does. But when I look back over the past year and think of everything she’s learned and how much she’s grown, it feels like it has to have been a year. It’s amazing to watch a human grow. We celebrated with a big pizza party with Matt’s and my families. It was really special–and also completely overwhelming. So many people. So many presents. So much food. We ended up delaying Ellie’s final tractor picture to the day after her birthday because it felt like we were trying to do too much. But I managed to finish a tractor cake for the big day–after Matt did an emergency run back to the grocery store for more icing sugar. Our other excitement this month came courtesy of Baxter. He met up with someone or something in the woods and came home with a few gashes. One on his neck ended up needing stitches. He was not happy with his vet visit–nor the haircuts that were needed for his IV and to assess his various wounds. But we are happy that his injuries were relatively minor, that we have an amazing, kind, caring, gentle, skilled, generous team at our vet, and most of all that he’s home safe. He’s now on leash any time he’s outside, especially since he is completely fixated on the woods, apparently looking for a rematch. Jen at Rambling Renovators has amazing style, and she is going behind the scenes, sharing her process of how to decorate a room. She shared how to start and how to layout the furniture. Bonus, she’s updating her daughter’s room, which is a super fun project… not that I’m planning Ellie’s tween bedroom yet… much. I’ve never made macaroni from scratch. But I’m trying to find an alternative to Matt’s favourite Kraft Dinner. I had high hopes for this vegan version (Chloe’s recipes have great flavours), but it was not a hit. Deb’s endorsement of Martha’s (non-vegan) version is making me think it’s the way to go. Any suggestions of how to get the flavour of KD with more real ingredients? “Start where you are. Use what you have. Do what you can.” Inspiration from Arthur Ashe via Thelma Golden in In The Company of Women by Grace Bonney. Did you celebrate anything this month? Or have any excitement courtesy of your pet? Do you have a macaroni recipe to share? What’s inspiring you these days? Growing up, my parents always included my siblings and me in whatever was happening at our house. Maintenance, building, painting, renovating, cleaning–we were all involved. Some of it was chores. Some of it was just how our family rolled. Looking back, I can see how these experiences gave us confidence, responsibility, skills, teamwork, work ethic, understanding and much more. This foundation set us up for our own homes and our own lives. I don’t think my parents necessarily thought too deeply about the long-term benefits their approach would have. They liked doing things with us and wanted us to be involved. Or they needed help, and they had 8 extra hands hanging around. … Or, more likely, they had 8 extra hands and needed to keep them busy. Today, a year into parenting, my sense is that most people spend a lot of time thinking–and worrying–about how to raise our children. What type of person do I hope my child grows up to be? How do I help her become that? I don’t think our aspirations are too much different than those of our parents. But I think we put a lot of pressure on ourselves and spend a lot of time reading different theories, trying different techniques and thinking about how to set our children up for success. Admittedly, I’ve only been doing this Mom thing for a year. I have a long way to go, and I expect that we will face many challenges. However, I’m hoping that I can channel my own parents and remember how much I benefited from simply being involved in whatever they were doing. Ellie and I did our first real build recently. You’ve seen her previously helping to make our invisible bookends and supervising some sanding. But this time she actually got her hands on some of the tools and materials. Of course, she also got her mouth on them too. My Mom gave Ellie a set of table and chairs for Christmas. I decided that since they were hers she should be part of putting them together. I of course spent a fair amount of time making sure she didn’t drop the drill on herself, stick the screwdriver too far down her throat, cut herself on the scissors, or eat too much of the packaging. But we also had fun talking things through, finding the right pieces and putting it all together. Fun is the best word I have to describe how it felt to build this little table and chairs with her. I hope we have a lot more fun in the future. And I hope that she grows up to be a confident, capable, helpful woman, in part because of the things we do together.